There are quite a few astounding moments in British journalist Will Storr’s confrontation with the paranormal. 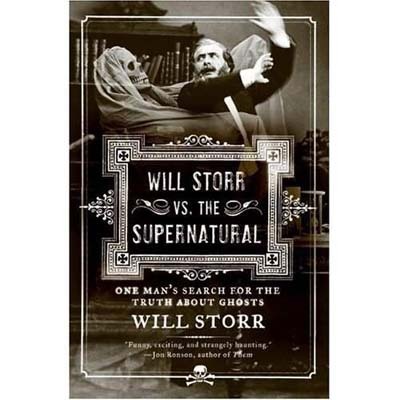 In his book Will Storr vs. The Supernatural, he brings into the ring self-professed demonologist and radio host Lou Gentile, famous researcher Maurice Grosse (who just passed away last October), UK’s Ghost Club, the legendary Clapham Woods, even the celebs of TV’s Most Haunted, among many others. Will steps foot into the house of the very private Janet, the central figure of the Enfield poltergeist case in 1977 and 1978 (her children know nothing of what happened to her when she was an adolescent). He spends the night at a few haunted locales, including the First and Last Inn at Land’s End in southwestern England. Plus there’s ghost hunting, séances, alleged possessions and many things that are… well… a bit silly. Will doesn’t hesitate to depict things as he sees them. In the process, Will manages to offer a very human view of the paranormal and those who pursue it nowadays. And, as with any exploration of this topic, nothing is conclusive. It’s reflective of how difficult it is to define things that are inexplicable. Will writes about how challenging it was to get people to speak openly about these topics and of the divisions that exist between paranormal enthusiasts in their approaches. It is a truly entertaining adventure, both for those who don’t know much about ghosts and those who are well-versed on the phenomena. I conducted an interview with Will via the magic of e-mail about his book and treading supernatural waters. Chris: Congratulations on a really engaging and informative book, Will. I'm wondering what inspired you to write on the supernatural. Will: Thanks! I was inspired to write the book after being sent on a journalist assignment to Philadelphia to shadow a man called Lou Gentile who calls himself a Demonologist. I was expecting him to be a bit of an eccentric, but ended up in a state of utter terror for two nights. I heard knocking on walls, EVP [electronic voice phenomena], saw “orbs” or “ghost lights” and was touched on the back by something. I also met some people who claimed to have experienced some truly incredible phenomena and who I felt were extremely credible. Chris: One of the key themes in the book are the many ways people approach the paranormal. In retrospect, which approach impressed you the most in terms of advancing our knowledge of ghosts and the afterlife? Will: I think I was most impressed with the approach of an organisation called the Society for Psychical Research, who have been around for over 100 years. They take a genuinely open minded, scientific approach to anything from ghosts to ESP to telekinesis – anything that could be termed “paranormal.” I think the fact that they’re chiefly made up of academics makes their work all the more credible. Chris: Have you had any unexpected reactions to your book? Will: I don’t think I’ve had any reactions that could be termed “unexpected.” I suppose I was half expecting some sort of legal threat from the makers of the TV show Most Haunted after I revealed all sorts of things about how they make their programme which viewers might be surprised about – like the fact that Derek Acorah’s “happenings” appear to be scheduled in advance. I’ve heard nothing from them, which has been a relief. Chris: Has the supernatural world continued to shadow you since the book was published? Will: I’ve had one or two strange incidents since the book came out. Farrah, my girlfriend, heard unexplained breathing in our flat about a year ago. The strangest thing, by far, though was when I was being interviewed on a Spanish radio station. The moment I started talking about EVP, the broadcast was interrupted by this hectoring voice that was shrouded in static. The DJ thought I was playing tricks and sounded quite angry. I thought it must just have been some sort of coincidence – a fault on the show. But then my phone rang after the interview. When I picked it up, it was the same voice, which carried on for about 30 seconds before going dead. That freaked me out for days! In terms of people, I met Dr. David Fontana, who’s a child psychologist and leading member of the SPR. He was amazing, again because he is a noted academic but also told me about his experiences investigating a poltergeist in Wales and a physical medium group in the east of the UK. He told me, “I have witnessed miracles.” He was an amazing man. Chris: What does 2007 have in Storr? Will: At the moment, I’m just very busy with the day job (I work as an editor a magazine in the UK). I’d much rather be out there working on a follow-up to the ghost book, but sadly I have a mortgage to pay!